FAST FOOD, HOLD THE BEEF But you can get 'chickin' at Veggie Grill. Can 'porque' and 'lamm' be far behind? Any vegetarian, no matter how patient and mindful he is, has once asked the question: Why, oh why can't there be vegetarian fast food, too? 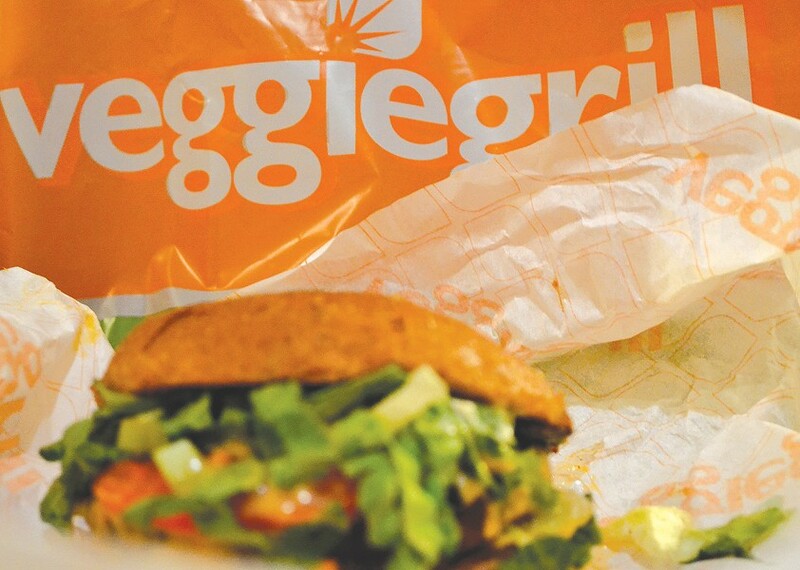 Veggie Grill is a canny entrant in the fast-growing vegetarian "fast-casual" restaurant sector. Since launching in Irvine in 2007, the Santa Monica–based chain has expanded to 28 locations on the West Coast. The first North Bay outpost opened in Corte Madera in 2014. Many items on Veggie Grill's menu are based on "Chickin," a product made by the Gardein company from soy protein concentrate, vital wheat gluten—both claimed to be non-GMO—and a host of other ingredients including "ancient grain flour." The burgers contain similar ingredients. Although they dare not print the word, Veggie Grill's menu is also vegan—no animal products involved. Is it fast? Time from ordering to receiving food was about five minutes on one visit, 12 minutes during a busier evening. Crispy cauliflower ($5.95) was the standout snack. Blanketed with batter and totaling 590 calories, this is surely no diet food, but it's a tasty bite, the crunchy cauliflower neither raw nor overcooked. If you harbor a hankering for hushpuppies or deep-fried mushrooms (Brown's Chicken, anyone? ), this is, at least, a reasonably healthful alternative. The savory kale caesar salad ($9.45) contains mostly lettuce, but unlike the insult of iceberg that most fast food joints offer as a salad, there's leafy green romaine here. I liked the creamy, caesaresque dressing and the tempeh bacon garnish, but vegan just can't do parmesan. Again, the mac-n-cheese ($4.65) side demonstrates why, for many of us, fake cheese is the Waterloo of vegan cuisine. Eat it fast, before the glue hardens. The buffalo mini-wrap ($3.85), a knockoff of certain other fast food snack wraps made with more of that "chickin." It's a spicy but cheap thrill, a late-night snack that any intoxicated college kid could put together. Much better is the signature Sante Fe crispy chickin' sandwich ($10.25). The ersatz chicken patty is moist, not overly breaded, and tears to the tooth with a degree of meat realism. Ultimately, vegetarian fast food must live or die on the cheeseburger, and Veggie Grill makes the grade with its basic VG-cheeseburger ($9.95). Slightly smoky, chunky and meaty, the burger's only fault is that it's a little dry. But it's a spot-on take on the meat substitute genre of vegan fast food dreaming. The choice of sides includes Yukon gold fries—pretty good, cut just thick enough so they aren't saturated with grease. But I was also asked, "Or asparagus soup with that?" With a hint of mint and some puréed texture, here's a more than serviceable little bowl of asparagus soup—a real vegetable serving, seasonally offered as a side to a fast-food burger. Who would've thought we'd see the day? Veggie Grill, 100 Corte Madera Town Center, Corte Madera. 415.945.8954.